One in 10 U.S. students in grades preK-12 attends a private school, according to the most recent data from the U.S. Department of Education. Surprised it’s not a higher share? Perhaps even more surprisingly, the private school share of total enrollments has decreased over the past 15 years, from about 12 percent to 10 percent. This trend seems unlikely to reverse. The U.S. Department of Education projects that in 2021, private schools will enroll about 9 percent of preK-12 students, while public schools will enroll 91 percent. The attention given to private school issues in policy debates and news stories may leave the impression that private schools play a greater role in American education than they do. Within the last few decades, several states have enacted programs to provide tax credits or publicly funded tuition vouchers to parents who enroll their children in private schools. Some states are currently seeking to expand their voucher programs, although states like Florida and Louisiana have come up against legal problems in doing so. In 2011, Indiana enacted one of the nation’s broadest voucher programs which has recently been declared as constitutional by the state supreme court. It’s noteworthy that these highly publicized policies to provide public support for private schools have not led to major increases in the proportions of students enrolling in private schools, according to the national data cited above. Enrollment trends differ for various types of private schools. 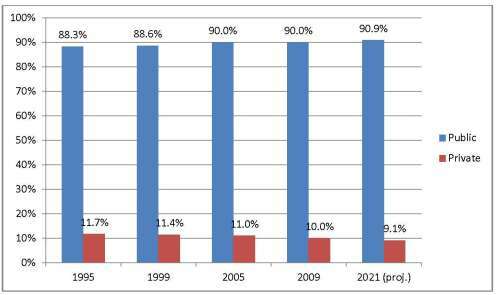 As the graph below illustrates, enrollments in Catholic schools have declined since 1995, as have enrollments in schools affiliated with a particular religion. 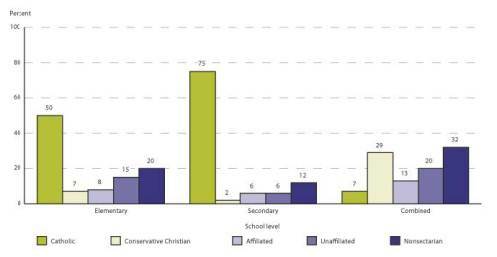 Despite increased enrollments in conservative Christian schools from the late 1990s through 2005, this sector now enrolls fewer students than in 2005, On the other hand, there has been an increase in the number of students enrolled in “unaffiliated” schools, which have a general religious orientation but are not attached to a particular denomination. Even with declining enrollments, Catholic schools are by far the largest private school sector. In 2010, half of the nation’s private elementary school students and three-fourths of its private secondary school students attended Catholic schools. Nonsectarian schools account for the next largest share, comprising one-fifth of private school enrollments at the elementary level, about one-eighth at the secondary level, and one-third among combined elementary-secondary schools. The enrollment decline in the large Catholic school sector is one of the main reasons why private school enrollments make up a smaller percentage of total enrollments. This trend began a half-century ago, following the peak years of Catholic school enrollments in the early 1960s. Many Catholic schools were built in inner cities in the neighborhoods where the Catholic population was concentrated. As Catholic families left the cities for the suburbs, inner-city Catholic schools lost their natural constituency, and many closed. In addition, Catholics have become more integrated into American society and less observant about key practices of their faith, such as mass attendance and baptism, which also might be relevant to the decline in Catholic school enrollment. The growth of the charter school movement is a second reason why the private school share of total enrollments has declined. Public charter schools, which have greater independence from the rules that govern other public schools, give parents additional options for their children without having to pay private school tuition. Only about 5 percent of all public schools are charter schools, but the numbers are growing. Charter schools tend to be concentrated in cities and in other areas with large numbers of low-income families. A final reason for the shrinking private school share is the recent deep economic recession. High unemployment rates and stagnant wages have made it more difficult for parents to pay private school tuition and have caused both poor and middle-class families to seek options other than private schools for their children. Some may view the recent decline in private school enrollment as evidence of a need for more tuition vouchers and tax credits. But even if legislation to expand private school enrollments were enacted in additional states, it would be unlikely to produce much change in the basic public/private school enrollment split. The real lesson to draw from these facts is that the future of the country is directly linked to how well the 90 percent of American students in public schools are being educated. The nation’s future workers, military troops, scientists, doctors, and political leaders will be drawn mostly from children now being educated in public schools. If we want a bright future, we must focus national attention on making public schools as good as they can be. This blog written by Jack Jennings originally appeared on March 28, 2013 in the Huffington Post.